This is a little disturbing to me! People stopping to pay their respects to Billy Graham and his wife, Ruth Bell Graham (d. 2007), have the opportunity to talk and pray with a Billy Graham Rapid Response Team chaplain standing nearby. Crisis-trained chaplains have been stationed near the grave markers since Mr. Graham’s passing in early 2018, and since then, they’ve prayed with more than 4,000 Billy Graham Library visitors. Crisis-trained chaplains with the Billy Graham Rapid Response Team typically deploy stateside and abroad in the wake of natural and man-made disasters to offer the comfort and hope that only Jesus Christ can bring. But since Billy Graham’s passing in early 2018, chaplains have also been stationed daily by his gravesite on the grounds of the Billy Graham Library. There, they have talked and prayed with thousands like Tom*, who have stopped to pay their respects to America’s Pastor and his late wife, Ruth Bell Graham. Tom* was supposed to be waiting at his gate in Charlotte Douglas International Airport, preparing to board a flight home to Daytona Beach, Florida. But on this particular morning, he changed his plans. Instead, Tom caught a ride six miles down the North Carolina road and found himself standing near Billy Graham’s grave marker at the Billy Graham Library. Tom, who ultimately wanted to pray to accept Jesus Christ as his Lord and Savior, is one of thousands who chaplains have spent time with at Mr. Graham’s gravesite. 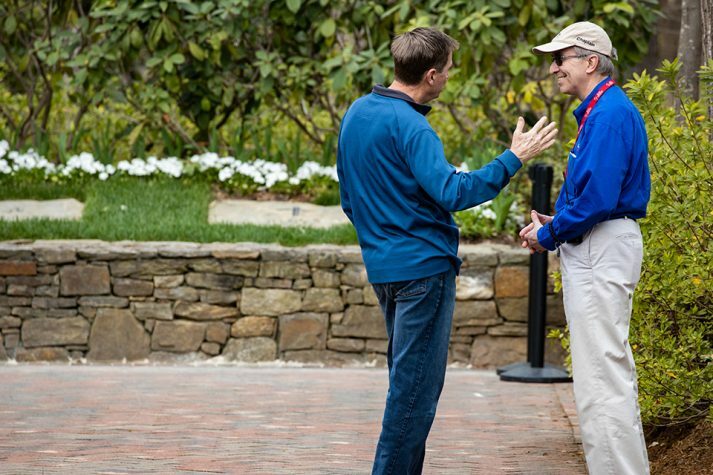 Since Mr. Graham’s funeral on March 2, 2018, chaplains have maintained a ministry of presence in the Prayer Garden at the Billy Graham Library. As the conversation progressed between Herb and Yuki, the chaplain soon realized this freshman student knew quite a bit about the Christian faith from his college friends. Yuki was interested to learn about the Steps to Peace with God and ultimately wanted to give his life to Christ. Herb escorted Yuki into the Library’s nearby prayer room, where he received a Bible to encourage him in his walk with Jesus Christ. Kathy and Dale Norgaarden were the chaplains ministering near Mr. Graham’s gravesite when William*, a Vietnam veteran, happened to walk up. William wasn’t quite sure where his wife and friend had gotten to. They were somewhere on the Library grounds, he said. It didn’t take long for a conversation to start up between William and the chaplains. William suddenly—and unexpectedly even to himself—began sharing stories from his war nightmares that he had never told before. The chaplains listened thoughtfully as he tearfully recounted these horrors. After a short time of prayer, William exclaimed he had no idea why his mind had gone back to those emotional times, but he agreed with the Norgaardens that God had brought him there to meet him with love and healing grace. 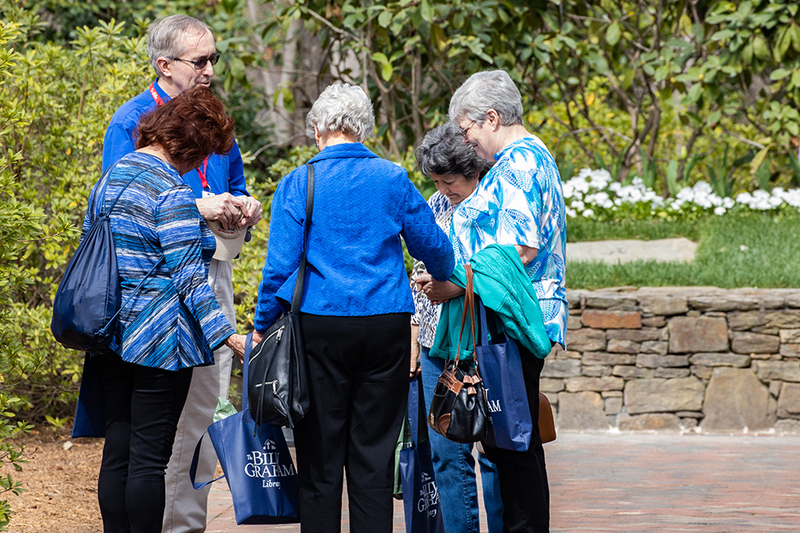 Chaplains have visited with countless individuals who have stopped by the gravesites of Billy Graham and his wife, Ruth Bell Graham, in the Billy Graham Library’s Prayer Garden. Three hours later, when William walked back down to the gravesites with his wife and friend, he was smiling. He seemed to be at peace. They’ve heartened others making major decisions, such as a Hawaiian woman who sold all her belongings to follow the Lord. And they’ve encouraged countless individuals facing hard times. Mae* and her adult daughters welcomed prayer after telling the chaplains they were visiting the Billy Graham Library to make lasting memories. Mae had just been diagnosed with rapidly advancing dementia. In another case, chaplains asked a gentleman named Jeff if he had a prayer need. Jeff struggled to speak through his sobs, managing simply “God knows.” Jeff cried as the chaplains prayed for healing and comfort. He later shared with the chaplains that Billy Graham had led him to Christ and he was struggling now because his treatment for bladder cancer was not working. Jeff thanked the chaplains for praying for him. Would you please keep this ministry in prayer as the chaplains continue to share the love of Christ? Life is hard, but peace is possible. Learn more about the God who loves you.